Australia Science Innovations » Gifted and talented kids: How do you nurture a curious mind? Australian Science Innovations > Stories > Gifted and talented kids: How do you nurture a curious mind? This article was first published by ABC Science. View the original article. Five young minds share their stories of how they’ve pushed beyond boundaries to excel in science and maths and what support helped them get there. When he was just 14, American Taylor Wilson became the youngest person in the world at the time to build a nuclear fusion reactor. It’s an amazing feat that he attributes to a combination of his curiosity and his parents’ support. “I don’t think anything sets me apart from anyone else other than I was uniquely curious,” he says in the first episode of Science Friction, ABC RN’s new podcast series exploring science, culture and everything in between. Taylor’s family moved hundreds of kilometres away from his home state of Arkansas, so he could go to a school for gifted children at the University of Nevada. Under the watchful eye of his family — none of whom were scientists — Taylor built a lab in his granny’s garage, and started amassing radioactive materials off the internet and from old nuclear sites. Before long, Taylor was knocking on the door of the physics department at the university to see if he could get support to build a fusion reactor — a type of reactor based on the same process that fuels the Sun. He was taken under the wing of two mentors and given a lab space to experiment. And in 2008, his dream became a reality. Since then he’s developed nuclear security and medical technology systems, given TED Talks, started his own company and, at 22, considers himself to be mid to late career. “I was very lucky that I found what I loved to do when I was 10 years old and I still get to do it,” he says. 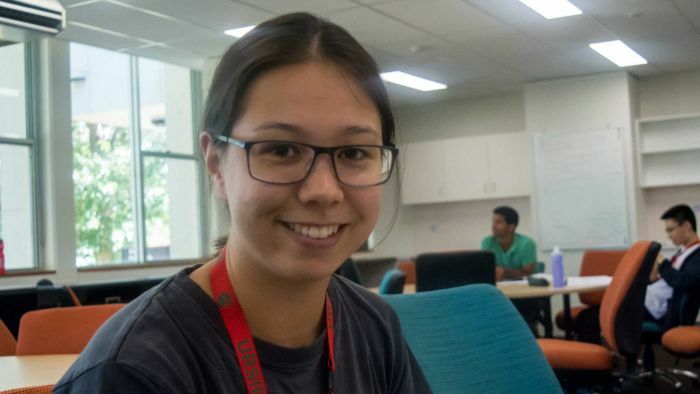 Next month, 17-year-old Claire Yung is heading off to Russia to represent Australia at the Asia Pacific Physics Olympiad. “There will be about 30 countries there, which is really exciting,” she says. At the Olympiad she will compete both as an individual and a team member in theoretical exams and fieldwork experiments. It’s not the first time she has represented Australia at the elite level. Last year she travelled to China, where she helped Australia take out gold at the International Geography Olympiad. The Year 12 student at Narrabundah College in the Australian Capital Territory has been interested in all things science since primary school. While her mum and dad — a soil scientist and a physicist — were her sounding board for questions, participating in extracurricular programs helped her extend her interest beyond what she could do at school. Claire has participated in a range of activities such as holiday programs from the CSIRO, to winning places in academic hot-housing programs such as Curious Minds, a program tailored specifically to develop STEM skills in girls, and the Australian Science Olympiad winter and summer camps at the Australian National University. Josh Marsh would love to work at SpaceX alongside Elon Musk, sending people to Mars. But for now, studying at the Massachusetts Institute of Technology (MIT) will have to do. The 17-year-old from the tiny town of Tully in far north Queensland has become one of just two students in Australia selected to do a term-long university level research project at MIT this year. He says he’s been ecstatic since he first got the phone call. “I honestly didn’t think I’d have that much of a chance getting in because there’s 400 of the smartest kids in Australia applying,” he says. Josh’s education hasn’t been traditional — he was home schooled from Year 5 until Year 11 because his family moved to the remote Dunk Island. But that didn’t put a stopper in his enthusiasm for science. Josh says he taught himself using online tutoring website Khan Academy and by reading Wikipedia. When he returned to mainstream school in the middle of last year he found he was well ahead in the sciences. Through his local Rotary Club, Josh got the opportunity to go to the National Youth Science Forum, an annual 12-day program in which Year 12 students live on campus at the Australian National University, visiting labs and attending lectures. “There were 200 of us there, and it was brilliant, probably the best two weeks of my life,” he says. It was there he also realised how isolated he had been when other forum members talked about the extracurricular activities they were involved in. Josh is currently fundraising for his MIT trip in June and hopes it will put him on a level playing field with students from the major cities when it comes to university and future jobs. Brittany Walker went through high school thinking she was going to be a doctor or a lawyer — two typical paths for a bright kid. But two years ago, when the Ulladulla High School student was in Year 10 she was selected for the Curious Minds program, after scoring a high distinction in the Big Science Competition. Curious Minds is a program for female high school students that aims to encourage and mentor them to develop a greater interest in science. Then earlier this year, 18-year-old Brittany sat for, and was selected to go to the Australian Olympiad summer school, a two-week intensive program studying earth and environmental science. “I loved the Earth and Environment Olympiad summer school, it was extraordinary. It was so good,” she says. She credits the Curious Minds program and summer school with changing her future — she’s now interested in pursuing a degree in mathematics and biochemistry. “Maths and physics are usually put into the same field, but when you put maths into other scientific fields it opens up a lot of things that haven’t been questioned before,” she says. Like Josh, Brittany says there are challenges living outside of a major city and trying to pursue an interest in science. “A lot of where our careers advisers guide us to is going into trades, going to TAFE, joining the Navy and all that stuff. Nobody ever really talks about uni,” she says. Her teachers helped her with after-school classes in maths in her final two years at Ulladulla High. But outside of that, there are no extra-curricular clubs, science programs and workshops like the ones kids in metropolitan areas go to, Brittany says. But she says having to take the initiative has also helped her develop independence. Still in his early teens, James Reid’s already performing at a level far beyond his age. At 13 years old, he’s been accelerated from Year 8 straight into an advanced Year 10 program at Canberra’s Gungahlin College, which has a Science, Maths and Related Technologies (SMART) program for gifted students. James says the support of his parents, and an interest in reading, helped grow his love of science from an early age. At this point in time he’s into chemistry, physics and maths, and says he finds the SMART program a much better fit with his ability than regular high school. “[At my old school] there were not enough practicals, the theory work wasn’t interesting whatsoever,” he says. James is the youngest person enrolled at Gungahlin College, but that doesn’t bother him at all. He also catches up with other gifted children his own age once every month or so. James says his interest in different fields of science swaps every couple of months, and he’s not sure which he might like to focus on in the future. “I’m really not sure where I want to go. I haven’t made my mind up about whether I’m going to go into IT, whether I’m going to go into a specific science, or if I’m going to do any other major job. I absolutely like IT,” he says.